These overwater bungalows situated off of the brightest, white sands of the breathtaking Maroma beach, surrounded by the tranquil, turquoise waters; gives unparalleled luxurious accommodations. Travel channel named Maroma beach one of the 10 best beaches in the world. Each bungalow features; glass bottom floors, private infinity pools, direct ladder access to the ocean, the romantic “Aguas deal Amor” outdoor shower, indoor jacuzzi for two, and oversized deck with lounge chairs. 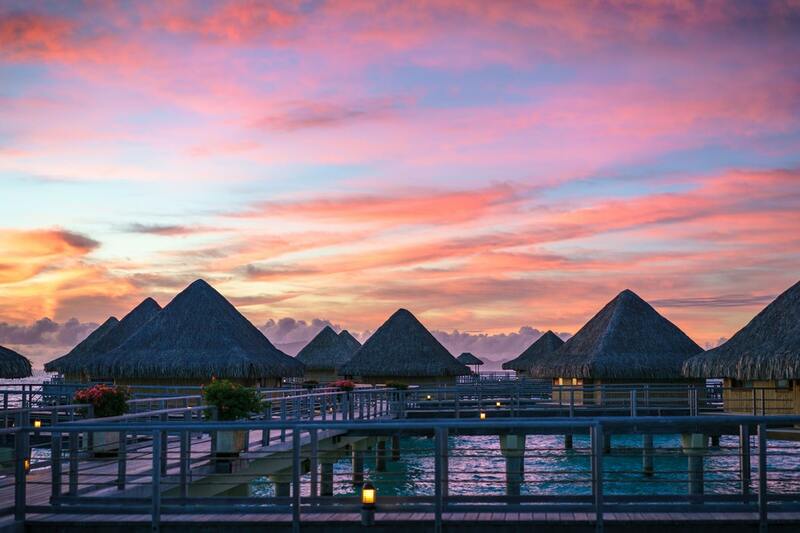 From the waters it looks like an ancient village, but it is the first overwater resort, in a natural ocean lagoon. It is hidden amidst the flawless environment. Staying true to the Fijian cultural values, traditions, and architecture; the resort is the design of a Fijian canoe house. Surrounded by sprawling ceilings, hand-woven thatch and an exotic mix of natural materials and modern elements. The resort symbolizes the ancient culture. Nestled in the shadow on Mount Otemanu. These French Polynesian villas feature hand-carved Polynesian sculptures, exotic wooden décor and an Italian-marble bathroom with a rain shower and bathtub. Some villas offer a private plunge pool, a hot tub or an outdoor shower. The balcony provides a panoramic view of the crystal clear, blue lagoon and adjacent islands. This family friendly, exclusive enclave, private paradise, in the heart of French Polynesia is a premier resort in Bora Bora. It possesses striking views of Mount Otemanu. They integrated unique architecture, containing walls made of volcanic stone and decorative accents fashioned from mother of pearl, and plunge pools. This resort radiates natural luxury. This gentle vibe Polynesian escape is placed between Moorea’s two iconic bays; Cook’s Bay and Opunohu Bay. The location is perfect to admire both, the sunrise to the east and the sunset to the west. All the villas come with private decks, a glass floor-panel for viewing the fish below, a marble bathroom, comfortable king-sized bed, and a plunge pool. They resemble a contemporary Polynesian design and offer all the comforts of a luxury hotel. The perfect location for these bungalows, gives you a scenic view of Taha’a, Raiatea, Huahine, and Bora Bora. The three overwater bungalows keep its feel from the Islands natural environment, so each bungalow is designed with exotic wood furnishings and quilted Tahitian bedding, direct access into the lagoon, and aquarium coffee table for a view of lagoon. And because there is only three bungalows, the atmosphere is kept peaceful and calm with only a select amount of guests. Placed on an incredible crescent out over the ocean and buggy down the path to your private villa; with a private pool, lagoon access right from your balcony, outdoor shower, two dedicated private butlers, a private chef, and a housekeeper to keep your island oasis running smoothly. This dreamland is amongst the bluest skies and turquoise sea. Here, the island comes alive for you. These Dhoni (local fishing boat) inspired villas are set off of the private shores of Kaafu Island in South Male Atoll. They offer you the most beautiful views of the crystal ocean. Each bungalow is connected by a sinuous planked walkway. Built from New Zealand pine with Kajan thatched roofs, each suite has peaked ceilings and glossy teak floors. Floor-to-ceiling windows open to large decks, obscuring the difference between inside and out. Blue and white décor brings the sea, sand and sky into the soul of every villa. This private island offers luxury, tranquility and a connection with the environment. The villas resemble the beauty of the Cambodian coastline. It’s a place that inhales the time with nature, constructed from local materials, by local hands, and filled with local art and soul. All the villas have a private sundeck with a private plunge pool, a daybed, direct access to the crystal-clear ocean, and an outdoor shower This pristine private beach takes tropical getaway to the next level. This heart shaped over-the-water bungalow overlooks the Caribbean Sea and delivers complete fascination of the turquoise waters and marine life below. Your private patio is complete with an extended sun deck, outdoor shower, sun loungers, and a bistro set for two. Couples can appreciate the beauty around them from their private outdoor Tranquility Soaking Tub for two or over-water hammocks. Inside, glass floor panels ensure you can enjoy undersea views any time. Greetings! Veryy helpful advikce in this particular post! It’s thee little changes that make the biggwst changes.